What is Flex-a-min Triple Strength? 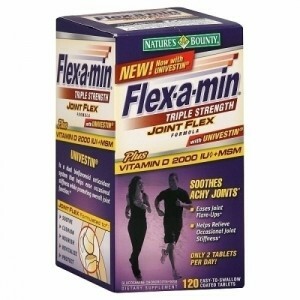 Flex-a-min Triple Strength is a joint supplement from NBTY, inc. which manufactures a variety of supplements. Flex-a-min has 4/9 of the ingredients we were looking for. Unfortunately it does not break down its “Joint Flex Blend” for us to see how much Chondroitin Sulfate, Collagen (Hydrolyzed Collagen), Citrus Bioflavonoids, MSM (methylsulfonylmethane), Boswellia serrata resin, Silica, Hyaluronic acid (as sodium hyaluronate), Chinese Skullcap (Scutellaria baicalensis) extract, and Black Catechu (Acacia catechu) extract it has. Flex-a-Min does use some unique compounds for arthritis including Chinese Skullcap and Black Catechu. We found no artificial dyes or coloring in Flex-a-min. Glucosamine Uses 1500mg of higher quality glucosamine hydrochloride. Glucosamine is a precursor to glycosaminoglycans which are a major component of joint cartilage. Chondroitin Sulfate Has an undisclosed amount of chondroitin sulfate. Chondroitin makes up glycosaminoglycans which are a component of cartilage. Methylsulfonylmethane (MSM) Has an undisclosed amount of MSM. MSM is a vital source of sulfur for protein and connective tissue synthesis. Hyaluronic Acid Flex-a-Min has an undisclosed amount of hyaluronic acid. Hyaluronic acid is a vital fluid found in the synovial (joint-lubricating) fluid. I have been taking Flexamin triple strengh for over a year now. works great for me. no complaints so far. it Does However take about 3-4 monthes before it starts working well. I am not so happy with Flex a Min now. Thought it was a better product a year ago. Have had great success with Move Free. I feel great. Question about both: they use chinese skullcap, which interacts to reduce BP for those who use captopril. Enalapril as well? I use enalapril. Wonder if it’s dangerous for us. I have osteoarthritis and I take flexamin triple stregnth, but hour in my job were cut off, so I need coupons in orden to continue taking this medicine. I have been taking Flexamin for about a year now and I am sold !! My knees feel so much better and they don’t grind as much as they used to. I believe in this product !! I have used Flex-a-min for about 15 years with great success and no side effects that I can tell. I take it for arthritis in my knees and a bone spur in my right knee. Read an article that says glucosamine chondroitin works for only 30% of the people who take it. I’m in the lucky minority. But it’s no longer sold at the stores where I’ve always bought it, and the price has gotten outrageously high. I WANT AN EXPLANATION! I WILL contact the manufacturers and will keep bugging them until I get a satisfactory answer!